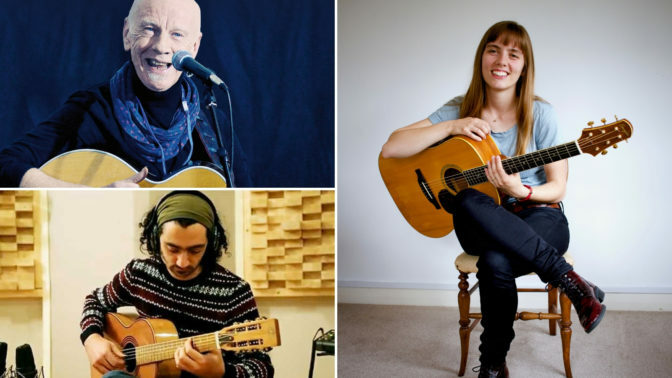 Following an extremely well-received inaugural course last year, we’re delighted to welcome back Kevin Dempsey, Tristan Seume, and Charlotte Carrivick for our second Guitar Workshop Week. The week is an intensive but enjoyable guitar-school week for steel-string acoustic guitarists, led by three fantastic tutors! The week will help you to develop your skills and confidence, with options to explore finger style, flat-picking, alternative and open tunings, arranging tunes and song accompaniment, chord vocabulary, and useful theory too. Whole group, smaller group and one-to-one teaching, to leave you enthused and inspired! There will be down-time too, for you to practise, jam, socialise and spend quality time with your instrument. For those who want to, there’s also the opportunity to join the tutors in concert on the Thursday evening. Kevin will be covering the basic fingerstyle patterns, plus variations. Introducing percussive elements. Chord construction, introducing extensions and increasing chord vocabulary. Learning a couple of complete pieces for solo guitar. Looking at chord/scale relationships. Tristan specialises in fingerstyle guitar, arranging traditional tunes and accompanying songs predominantly using CGDGCD tuning. This beautiful and versatile modal tuning remains curiously overlooked in favour of more commonly explored DADGAD, open D and open G tunings. Tristan will explore the tuning’s potential from the ground up whilst referencing and relating to other, more familiar tunings. We will work through the fundamentals, beginning with useful, go-to chord shapes and patterns and progress through developing left- and right-hand techniques, incorporating open strings, drones and harmony within the context of traditional repertoire. Charlotte will cover the basics of flatpicking for both lead and rhythm playing, working up towards creating more intricate solos and interesting backup. We will be learning how to make fiddle tunes sound great on the guitar and how to make them your own. As a style with a big focus on improvisation, we’ll be looking at ways to expand your knowledge of the fretboard and open up different pathways on the guitar. (For guitar in standard tuning, this course requires a plectrum). This course is aimed at acoustic guitarists (steel-strung) of an intermediate level and above, it’s not really suitable for beginners. Beyond this, enthusiasm is much more important than skill level; we only ask that you join in to the best of your ability. This week is all about helping you develop your playing, whatever your current level of ability, and sending you away with the inspiration and tools to continue to improve. Tristan Seume is acclaimed as one of the UK’s leading acoustic guitarists, and has toured all over Europe both as a soloist and a sought-after accompanist. His two solo albums, You Just Know and Middle Child mix handcrafted originals with beautiful interpretations of traditional and contemporary tunes. He performs regularly with BBC Radio 2 Folk Award-winning artist Jackie Oates, and has recorded and played with many other artists on the UK folk scene.